The new school year usually brings much anticipation and excitement. It's time to focus on learning! School children should not have to worry about where their next meal is coming from. But in many African countries that is the crisis they face as school opens. Why? Funding is running out. These are forgotten children in Cameroon, Mali, Mauritania and Niger. A number of these children are victims of the Boko Haram war, having been displaced by the terrorist group. These are countries with high poverty rates, but also dealing with the impact of war and drought. Families in these nations struggle to find one meal a day, and WFP school meals are often their only hope. Abdou Dieng, WFP Regional Director for West Africa, says, "In most countries in West and Central Africa - in the grip of chronic hunger and malnutrition, and increasingly affected by conflict - school meals have been a lifeline for children, as they are often the only regular and nutritious meals they receive." Chad is another country that has been facing the loss of WFP school meals. The program has shrunk dramatically in recent years, going from 200,000 children fed in 2013 to only 15,000 in 2016. The Central African Republic is another where school meals may be cut unless funding is increased. This country has been threatened with famine since conflict has escalated there. School feeding works, but only if the funding is provided. President Obama's recent trip to Laos highlighted the importance of food for education. 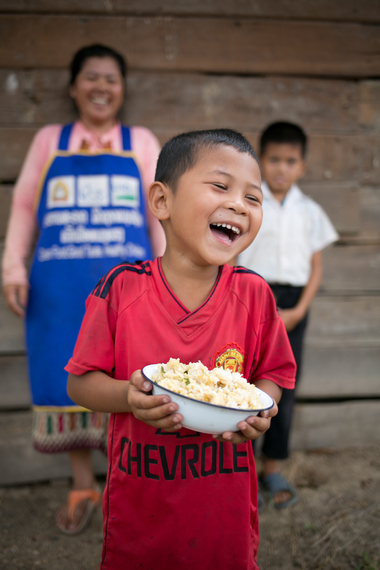 Catholic Relief Services, with the support of the U.S. McGovern-Dole program, provides school meals in Laos. And the impact has been unbelievable. A joint declaration at Whitehouse.gov between the United States and Laos reads, "The two leaders noted the positive outcomes of the ongoing U.S. Government-funded School Feeding Program, for which the U.S. Government is currently providing over $27 million in funding over five years." Before the school feeding project started only 52 percent of parents said their children were not suffering from hunger in the six districts of Savannakhet. After the school feeding got underway that number jumped all the way to 87 percent. Food at school is a winning combination. It does not cost much and it should be expanded worldwide. In Africa, there is an urgent plea for funding to save school meals for needy children. We can answer this call for help at low cost and with everything to gain. WFP and other humanitarian agencies depend on voluntary donations. It's time to prioritize school meals in foreign aid budgets.